The interconnected world has not only opened up millions of new niches for entrepreneurs to start their small businesses but also hosts countless sources of advice on the web – allowing you to connect with other small business owners, learn from their mistakes and use their successful decisions as a guide for your own path as an entrepreneur. If working 9-5 isn’t suited to you, perhaps it’s time to climb your own ladder where you set the pace and make your mark on the world. If you have a bright idea or a burning interest, here are seven reasons for why you should start your business today. Instead of bashing your head against a wall every time your boss makes a mistake, be the one making decisions – and hold yourself accountable to them. If that thought alone scares you, it’s time you begin planning your journey in becoming an entrepreneur. If you consider yourself to be talented across a range of key skills, entrepreneurship is a way to utilise your proficiencies to their full potential. As an entrepreneur you’ll fill many roles in your small business, especially when starting out, which is why you cannot be afraid to do some of the dirty work. Many days you’ll find yourself in the position of anything from leader to marketer to therapist to receptionist. From choosing an area of business to building your own professional network and crafting a unique workplace culture – it’s all up to you. But, it’s important to remember the reason for why you are doing this when the going gets tough. Statistics show roughly two-thirds of small businesses survive two years in business with half of all businesses surviving five years, and one-third surviving 10. It’s clear those first few years of starting a business are the toughest, which is why, if passion is lacking from the get-go, it’s unlikely to sustain you in the long run. Perhaps your current job doesn’t pay what you’d like, or maybe you’ve got a sideline passion project that has the potential to become a lucrative full-time career. US entrepreneur, Lori Greiner says, “Entrepreneurs are willing to work 80 hours a week to avoid working 40 hours a week.” But does it pay to be an entrepreneur? Starting a new business means you have the opportunity to hire and train those who may not have had the opportunity for work in the past. It also means you get to make a meaningful impact on society. 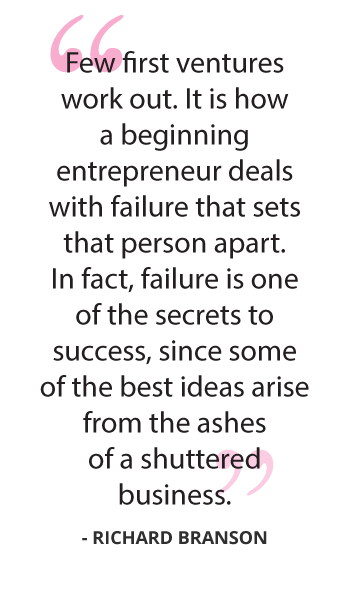 Even Sam Paddock, Co-Founder of GetSmarter, is quick to admit many startups fail, before one eventually takes off. Instead of waiting for someone to give you a chance to be the best at something you’re passionate about, create your own opportunity. As the saying goes, “Do one thing and do it well”, rather than trying to spread your time and money on many ideas that carry little weight. Follow the words of Steve Jobs: “Your time is limited, so don’t waste it living someone else’s life. Don’t be trapped by dogma – which is living with the results of other people’s thinking. Don’t let the noise of others’ opinions drown out your own inner voice. And most important, have the courage to follow your heart and intuition”. Take the leap and gather the knowledge and skills you need to embrace entrepreneurship by taking the UCT Start and Manage a Small Business online short course. Print out this handy infographic for seven reasons to build an organisation right now, and start creating your business plan today. Want access to more career-boosting guidance? Have a look through our collection of entrepreneurship advice.